Want your WB20 or WB30 general purpose pump to provide years of trouble-free service? Here’s what you need to know to keep up on maintenance from using the right fuel to getting a good spark. Every 6 months or 100 hours: Change oil, check the spark plug, clean sediment cup and, if equipped, spark arrester. Every year or 300 hours: Replace the spark plug. Honda recommends having this pump professionally serviced every 6 months or 100 hours to clean the combustion chamber, fuel tank, and filter, and every year or 300 hours to check the idle speed, valve clearance, impeller and pump inlet valve. The WB20 and WB30 use different engines, but because they use the same basic design, maintenance is virtually identical. The engines in these pumps are designed to run on 86 Octane or higher with a maximum of 10% ethanol (E10) or 5% methanol. Use a stabilizer if fuel will be left in the tank for more than one month after purchase. Replace the fuel after three months. When adding fuel, only fill to the bottom of the filler neck. The inch of air space left in the tank is needed to let the fuel expand when heated up during operation or storage. Make sure the vents in the cap are clean to let air enter the tank as fuel is drawn into the carburetor. To get an accurate reading when checking the oil level, wipe off the dipstick and insert it into the filler neck without screwing it in. Honda recommends oil with an API service category SJ or later. 10W30 will work under most conditions, and SAE 30 can be used at operating temperatures between 50 and 105ºF. To drain the oil, remove the drain plug to the left of the oil filler neck. Use a new sealing washer when reinstalling the drain plug to ensure a tight, leak-free seal. The engine in the WB20XT holds 0.59 quarts, while the engine in the WB30XT holds 0.61 quarts. When adding fresh oil, it should come up to the edge of the filler neck. To open the air cleaner box, remove the wing nut on the top of the box followed by the cover washer and air cleaner cover. From there, the filter and grid can be lifted off of the carburetor. If the air filter is dirty, clean it using a non-flammable solvent or water and a mild detergent. Once dry, soak the filter in clean engine oil and squeeze out any excess. To clean the cup, set the fuel valve lever to “OFF.” Unscrew the sediment cup, located directly below the fuel switch, and remove the O-ring that sits between the cup and the carburetor. Wash the cup in a non-flammable solvent. Place a new O-ring in the carburetor opening and reinstall the sediment cup. Open the fuel valve and check for leaks. When installing the plug, screw it in by hand to prevent cross-threading, then tighten it down with the plug wrench. Once the plug seats, turn it another 1/8-1/4 turn if it’ s a used plug, or ½ turn if it’s a new plug. These pumps don’t come with a spark arrester, but one can be added to meet local fire and safety regulations. Let the engine cool for at least a half hour before handling the muffler. To access the arrester, first, remove the two 8mm nuts attaching the muffler to the engine. Remove the muffler. Next, remove the four 5 mm screws from the muffler protector, then remove the protector from the muffler. Remove the 4 mm screw from the muffler outlet. You can now slide out the spark arrester. Clean off carbon deposits on the arrester with a wire brush. If there are cracks or holes in the arrester, it needs to be replaced. Reassemble in reverse order. 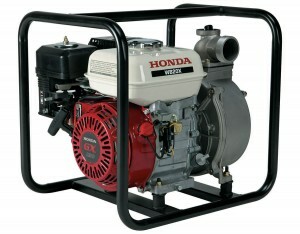 Hondalawnparts.com is a certified Honda Power Equipment and Honda Engines dealer. From hoses to spark arresters, if it’s Honda, we can ship an OEM replacement to your door whether you live in the U.S. or Canada. Need help finding a part? 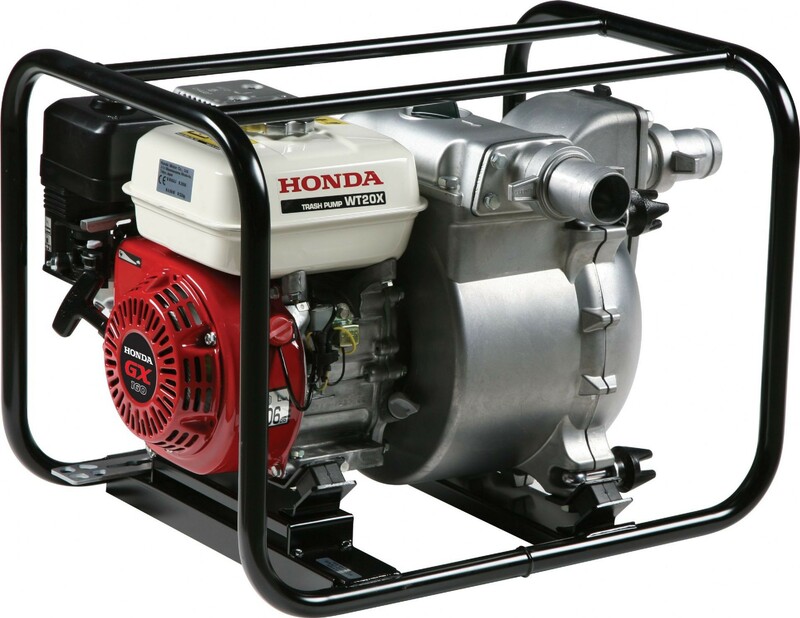 Browse our water pump accessory section or select your model using our search engine to see Honda factory diagrams and pick what you need. Honda’s gas-powered pumps are great for temporary use, but what if you have a situation where you need to move water in a fixed area continuously? By using sealed electric motors, their submersible pumps can handle constant operation, making them perfect for jobs ranging from irrigation to flood cleanup. It may not have one of the company’s famous engines, but these pumps are still built with the attention to detail that gives Honda products their reputation for reliability. This starts with a stainless steel case that will remain rust free where coated cases will eventually rust. It insulates the motor with a blanket of air, keeping everything cool when submerged in warm water. Oil lubricated mechanical seals prevent damage if the pump runs dry, and a float switch is included with every model to shut the pump off automatically once the area has been drained. The motor is further protected by a built-in thermal automatic reset to prevent overloading. The pump shaft rides on shielded ball bearings for hundreds of hours of maintenance-free service. Honda makes both water and trash pumps. Water pumps can handle solids up to 3/8 of an inch in diameter, and they have top-mounted discharge ports. Trash pumps can handle solids up to two inches in diameter and have side-mounted discharge ports. Along with flow rates and solids capacity, there are two other factors that need to be taken into account when choosing a pump. Head is the maximum vertical distance the pump can move water. Since the intake is built into the bottom of the pump, this is the distance from the pump outlet to the top of the system. Power cable length also limits the placement of the pump. It’s built into the pump for a watertight seal, and due to high power demands, it should be plugged directly into an outlet. The WPS33 has a 1/3 hp motor that can move up to 40 gallons of water per minute. It has a maximum head of 23 feet, and it comes with a 20-foot power cable. The WSP53 uses a ½ hp motor, giving it a maximum flow rate of 70 GPM and a maximum head of 44 feet. It comes with a 50-foot power cable. The WSP73’s ¾ hp motor pumps water up to 54 feet high at a rate of 74 GPM. It comes with a 50-foot power cable. The WSP50’s ½ horsepower motor pumps water at a rate of 110 GPM. It has a total head of 32 feet and comes with a 25-foot power cable. The WSP100’s one horsepower motor moves up to 150 GPM with a head of 42 feet. It comes with a 25-foot power cable. 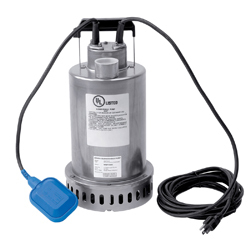 Setting up a submersible pump is much simpler than setting up a gas-powered pump. The strainer is built into the base of the pump, while the discharge opening is designed for use with solid or flexible pipes with G2 pipe fittings. A no-return valve should be built into the pipe system. A heavy cable or rope should be tied to the handle of the pump to lower it into the water and raise it back up. The plug is designed to use with three prong grounded sockets. www.hondalawnparts.com is a certified dealer for Honda Power Equipment, letting us offer OEM parts for everything Honda makes from gas-powered diaphragm pumps to electric submersible pumps. Whether you need a strainer or a float switch, we can ship your order to any address in the U.S. or Canada. String trimmers have to be small and light, forcing manufacturers to make compromises on usability and reliability. However, Honda has managed to address those issues with their own trimmers. Built around their compact four stroke engines, these trimmers have operator-friendly features and a long list of accessories to take the frustration out of yard work. Tightening emissions laws mean the two-stroke’s days are numbered, but there are plenty of reasons to choose Honda’s Mini 4 Stroke over a two-stroke aside from its low pollution design. A clever oil baffle system keeps the engine lubricated in any position, so they can be used and stored like a two-stroke. Since it still has an oil sump, straight fuel can be used to power the engine instead of oil and fuel mixtures. The valves seal the combustion chamber when the air and fuel ignite, making the engine much quieter. Intake and exhaust cycles are also separated, so fresh fuel doesn’t flow straight out of the engine. This improves fuel efficiency up to 50%. This also helps the engine is getting the exact mix of air and fuel it needs, making it easier to start. 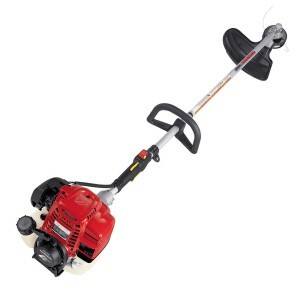 Torque is produced over a wider RPM range, so these trimmers don’t bog down as easily as two-stroke models. Honda’s trimmer models use a loop handle that lets the operator switch hand positions for less fatigue. A single strap harness and safety glasses are included. The HHT25STLA comes with a 25 cc engine, weights 13.1 lbs. and uses a Semi-Matic bump head to cut a 17-inch swath. The HHT35STLA is similarly equipped, but it uses a 35 cc engine and weighs 14.8 lbs. The HHT35SUKA comes from the factory with everything you need for brushcutting, including a double harness, a debris barrier, and a 10-inch saw blade. A Kwik Loader head is also included for string trimming, cutting the same 17-inch swath as the standard trimmers. This model also uses a wide bicycle-style handle makes the brushcutter easy to control while minimizing kickback. The UKA is powered by a 35 cc engine and weighs just over 16 lbs. with the cutting head installed. There are plenty of landscaping jobs that can benefit from motorized power, but it doesn’t make much sense to have a piece of equipment that will only be used a couple times a year. With Honda’s VersAttach system, several tools can be attached to a single power unit, reducing cost and maintenance. Compatible tools include an edger, trimmer, pruner, hedge trimmer, cultivator, and blower. Extensions are also available to increase the unit’s reach. Most buyers will find they get the most use out of the trimmer attachment. It comes with a bump head and cuts a 16.5-inch swath. Safety glasses and single harness are included. Honda offers a three tooth grass blade for light brush, but there’s no provision for larger blades, nor can these units be fitted with a double harness. Power units include the 25 cc UMC425 and the 35 cc UMC435. All VersAttach tools are compatible with both models. Honda offers three, four and 8 tooth grass/weed blades in 9 and 10-inch sizes as well as a 24 tooth brush blade for the HHT25 and an 80 tooth brush blade for the HHT35. These blades are also compatible with the HHT35UKA brushcutter. When using a metal blade on a trimmer, a barrier kit should be installed to deflect debris, while a double sling is recommended to give the operator better control of the trimmer’s position. The heads on these units are compatible with several trimmer heads including the Kwik-Loader and Prolux’s manual and semi-manual heads. Honda guarantees their trimmers and Mini 4 Stroke engines for two years residential or one year of commercial use. The flex shaft, which transfers power from the engine to the head, has a limited lifetime warranty. 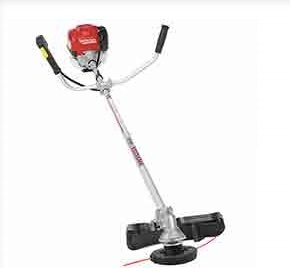 As a certified Honda Power Equipment and Honda Engines dealer, www.hondalawnparts.com is able to offer the full range of OEM parts and accessories for these trimmers. Our site has built-in factory parts diagrams and descriptions, and you can search for parts based on your equipment’s engine and serial number. We ship across the U.S. and Canada.